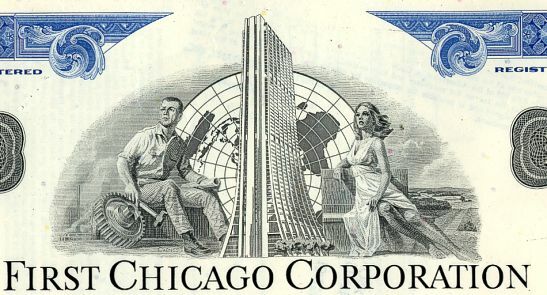 Beautifully engraved certificate from the First Chicago Corporation issued in 1975. This historic document was printed by American Banknote Company and has an ornate border around it with a vignette of a man and woman next to the company's headquarters. This item has the printed signatures of the Company's President and Secretary and is over 33 years old. 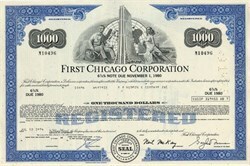 First National Bank of Chicago was a subsidiary of First Chicago Corporation in 1969. In 1995 it merged with NBD of Detroit, creating First Chicago NBD Corporation. In 1998 First Chicago NBD merged with Banc One Corporation and became Bank One.